It's hard to believe that this blog has been running 12 years with nary a mint slice recipe! It's my favourite kind of supermarket biscuit, and a pretty common recipe for home baking too. I scanned a few popular local sources (Cadbury, Taste, Donna Hay) and cobbled together something that fit my preference: a biscuity base with coconut but not eggs; a minty layer with soft fondant texture and no food colouring; the darkest of chocolate tops. No copha! Turns out that it's pretty easy to make this version vegan too. The intensity of the mintiness is definitely up to personal preference, and even then I find it hard to judge what quantity of essence will hit the level I like. I proceeded with caution, and ended up sneaking some extra in the chocolate layer it ramp it up. Don't be surprised if you need to experiment over a few batches too. I'd highly recommend storing this version in the fridge - the base is a bit crumbly and the mint filling definitely has a bit of squish to it! Preheat an oven to 180°C. Line a 20cm x 30cm baking tray with baking paper. In a medium-large bowl, sift together the plain flour and cocoa. Stir in the coconut and sugar. Melt the margarine in a small saucepan or microwave, and pour it into a small bowl. Stir together the ingredients until well combined, then press the mixture into the base of the baking tray. Bake for 12-15 minutes, until cooked through. Melt the margarine in a small saucepan or microwave. Sift over the icing sugar and whisk until smooth, adding just enough vegan milk to create a thick, smooth fondant. Stir in the peppermint essence. Pour the icing mixture over the base, smooth it out, and refrigerate until firm, about an hour. Melt all of the topping ingredients in a double boiler set-up and stir until smooth. Pour over the slice, smooth over, and refrigerate until firm, about 30 minutes. Store it in the fridge, and cut the slice into rectangles to serve. In this final post about our holiday in China, I want to pay tribute to jianbing. 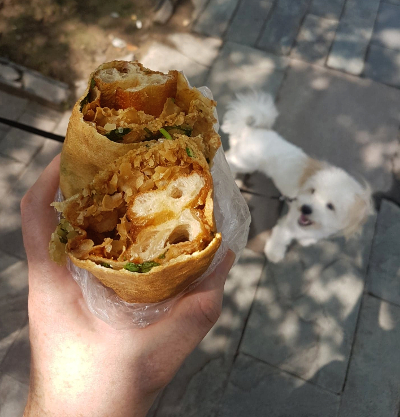 A completely new food to us, jianbing is typically sold from a small stall at breakfast time (the vendor near our Shanghai apartment was clearly subletting his spot and all trace of his business vanished by 10am each day). Jianbing is the crispy golden savoury breakfast of my dreams: a thin pancake with an egg cracked over it as it cooks; sprinkled with spring onions, ginger and garlic; folded once and spread with chilli paste; topped with a fried cracker and folded twice more; sliced in half and tossed in a bag. Watch the entire process skillfully accomplished in just 60 seconds in the video below. It costs the equivalent of one or two Aussie dollars, and there's a couple of small variations available. Our vegan mates ordered egg-free ones, which this vendor happily made, though it clearly disrupted his muscle memory! We liked to pay extra and have a doughnut stick rolled in with the cracker (see top photo), and we noticed other people getting meat in theirs. Though jianbing is clearly an oily sometimes-food with limited nutritional value, we strategically walked the dog by this stall every couple of days, eating all the jianbing we could handle before we lost access to it. It's an experience we don't expect to replicate in Melbourne. Noodles were a part of our meals in China at least as often as potatoes. Sometimes they were served as a single dish during a shared meal; at others we each ordered a big bowl of our own. They were always terrific. 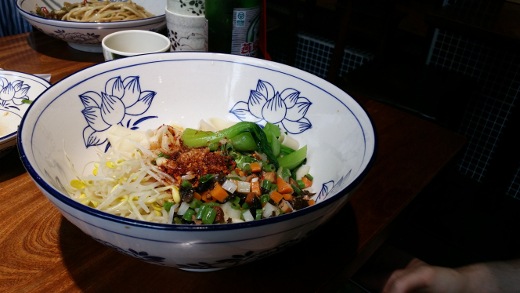 This small bowl of noodles was the first dish to arrive at a Yunnan restaurant. 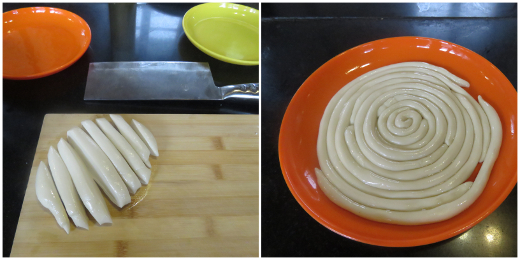 The translucent noodles were based on mung beans, sliced into thick batons and served cold. Their dressing was one of the most fiery chilli oils of our holiday, and sent me into a coughing fit. These thin, chewy Shanghai-style noodles were much more forgiving, stir-fried with salty-soy flavours, mushrooms and green vegetables. After a hot day traipsing around town, I should not have been surprised that cold noodles with shredded cucumber would be so refreshing! They were lightly dressed in broth with dots of chilli oil. They were a little upstaged, though, by our accompanying bowl of youpo mian (oil pulled noodles). These feature kudai (belt) noodles with a few steamed greens and an unforgettable dressing of chilli, garlic and oil. I was tentative about the chilli-intensity initially, but discovered a smoky slow-burn that I not only could handle, but absolutely loved. We had some more cold, translucent mung bean noodles in a Dongbei restaurant. They were impossibly slippery for an inelegant chopstick-operator like me, but worth the awkwardness for their sesame dressing. These cold Sichuan noodles were somewhat familiar from our visits to Dainty Sichuan in Melbourne - I've grown to enjoy the invigorating contrast of their cold temperature and fiery spice (and I'm especially please when they're served with peanuts). 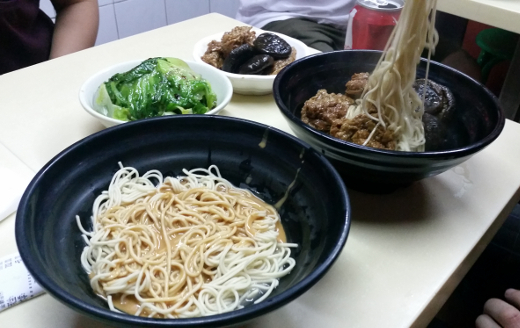 We ordered these noodle bowls from an alley-way noodle shop that's Michelin-recommended: Ding Te Le. Slathered in peanut sauce (pictured front), they were impossibly rich - three of us barely finished the bowl between us. Submerged in broth and served with some meat-mocking mushrooms (pictured back left), these thin fresh noodles were at their best. Here's a second bowl of youpo mian from a different restaurant, where it was served with assorted finely chopped vegetables and fresh bean sprouts (but just as much garlic, chilli and oil!). 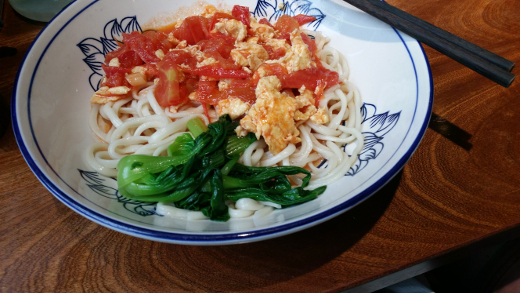 At the same restaurant, I ordered the noodles with tomato and egg after learning that this is a very common vegetarian option throughout China. It was so mild and nourishing - I could imagine what a comforting meal this could be when you're sick. But I wasn't sick, and I was a bit jealous of Michael's second excellent bowl of youpo mian. Our holiday in China was hosted by two lovey locals - one a fluent Chinese speaker, and the other a vegan resident of one year with a growing vocabulary. They provided us an experience we could never have arranged for ourselves! In particular, Michael and I tend to rely on Happy Cow to guide our eating while travelling, but our hosts simply led us to regular family restaurants and picked wisely from the menu. Many menus included photographs of the food, and more than I expected to added English text too, so we had our turns at ordering. Another pleasant surprise was the wide array of potato dishes to be had! Here's a sample of the wonderful potatoes of China. At a Hunan restaurant our thinly sliced potatoes arrived slightly undercooked, with a burner underneath ready to finish the job in front of us. It was difficult to resist picking slices from the top, while raw onion slices, whole garlic cloves and chilli bubbled in oil underneath. Waiting and stirring and waiting some more yielded richer, spicier slices. 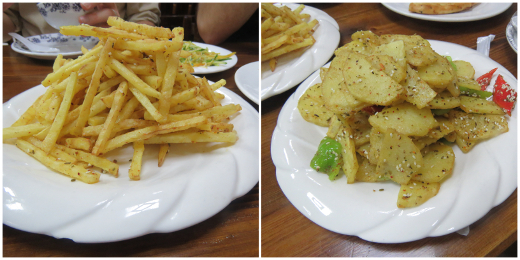 These Sichuan-style potatoes were served fully cooked and sliced a little thicker, with a solid chilli hit but none of the numbing pepper that the province is famous for (rest assured, there was plenty Sichuan pepper in the other dishes on the table!). We received similarly sliced Yunnan potatoes in a hot ceramic pot; they had a lovely caramelisation to them and a telltale puddle of chilli oil in the bottom of the pot. 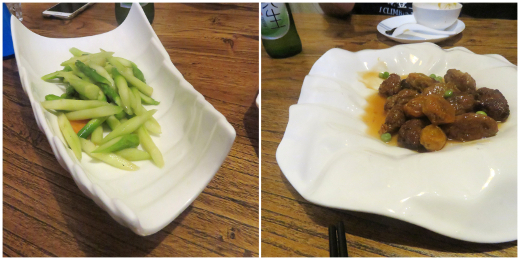 This dish was described as a Shanghai presentation of a Dongbei dish, which we had several times over on our trip. 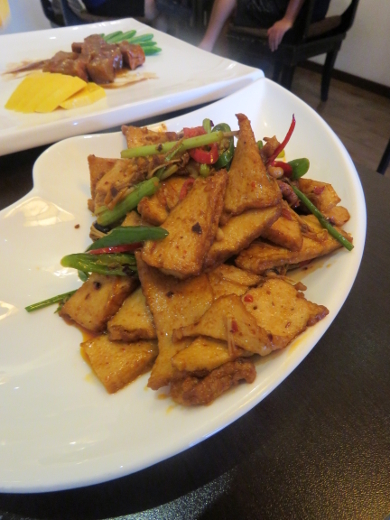 Here the potatoes are served with eggplant and capsicum, and they're all smothered in a thick, sweet, soy-salty sauce. Here's another version of the Dongbei potatoes, eggplant and capsicum; less caramelly and more garlicky, with the potatoes having a confit texture. The shredded potatoes are a different experience altogether! They're so lightly cooked that they retain some raw crunchiness, and they're made even fresher and livelier with a dash of vinegar. Eating in a Xinjiang halal restaurant was one of the more unexpected experiences of our trip. Our disinterest in mutton meant that our order looked very different to the ones at neighbouring tables, and our waitress tried to persuade us away from ordering two plates of potatoes. They had a common seasoning that included sesame seeds and cumin and reminded me of za'atar or dukkah, and the effect was subtly different but just as good on both the potato sticks and the flat rounds. While we always expected to be stuffing ourselves silly on rice and noodles in China, we were thrilled to have so many meals with our other favourite carbohydrate, the potato. Beijing's 798 Art District is a unique neighbourhood of decommissioned military factory buildings that now hold a network of art galleries and small shops. There's plenty of public works and free exhibitions, but also a scattering a large galleries well worth the price of admission. On our first visit we wandered without much purpose, falling upon a noodle shop when we were hot and hungry. 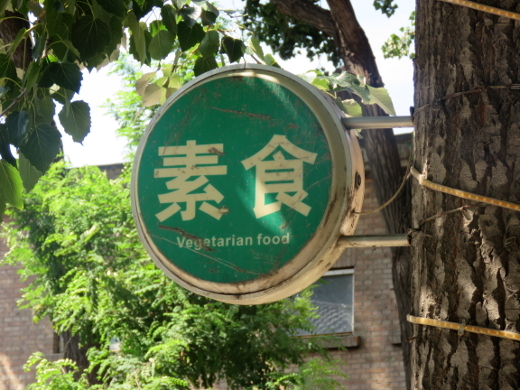 Then, sated, we walked some more and came upon a sign reading Vegetarian food (it's photographed below). Well, damn. When Michael and I returned to the District a few days later, we carefully retraced our steps and made sure we ate at Zen Beans/Chán dòu. While the staff weren't fluent in English, they've made excellent accommodations. The menu includes English text and enormous colour photographs of all dishes. The young man serving us didn't hesitate to pull out his phone translator to check that we understood that the mock meat we were ordering wasn't real meat at all. Yes, we grinned back at him. 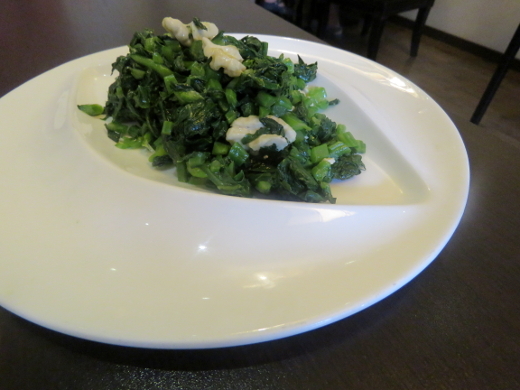 The finely chopped and steamed Chinese broccoli was served with blanched walnuts (31 yuan ~ AU$6.20), a simple start before those rich mock meats arrived. We'd noticed a few interesting ham and bacon-based plates, and picked out the braised pork in brown sauce. The mock meat cubes had lean and fatty layers and a sweet sauce. I was surprised to see it served with mango, and saved my share of the fruit until the end of the meal. The spicy mock chicken with mushroom (43 yuan ~ AU$8.50) was definitely more spice than mushroom, and I had only a few pieces before conceding most of the plate to Michael. There was still mango, complimentary watermelon, and my cup of tea to soothe my palate. The 798 Art District is a must-visit for anyone in Beijing. And for veg*n eaters, we'd recommend seeking out Zen Beans for a full lunch in a comfortable, welcoming setting amidst all the walking - check our Google map to ensure you don't pass it by as we initially did. We didn't give ourselves a lot of time to track down the veg*n restaurants of Beijing but I did ask Steph for her one most enthusiastic recommendation and she nominated Baihe Lily. There are three Lily restaurants across the city, and this one was a convenient couple of kilometres from our accommodation. We stopped in for an early, quiet dinner after a hot day hiking up to the Great Wall (see photo at the end of the post). Online sources had helpfully pointed out that from the hutong entry, this restaurant simply looks like a small wholefoods shop. On entering, a series of courtyards and small rooms emerge, each decorated with plants, mismatched comfy furniture and soft lighting, with bookcases forming extra partitions between tables. These afforded us a sense of privacy and quietude even though there were plenty of other customers about. While the staff spoke pretty good English, the menu was a bit of a mystery; stored on an ipad with haphazard English and Chinese labels, Michael and I just swiped around and picked whatever took our fancy. The first to arrive was a plate of very hot glazed eggplant batons with edamame - we hadn't tired of this sweet-soy style yet, even after eating it repeatedly. 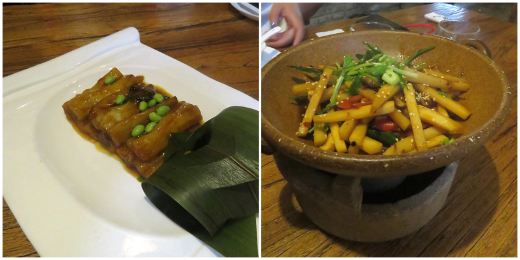 A heated clay dish of bamboo shoots was more novel to us, and contained a generous dose of chilli. The asparagus was much lighter and plainer, while our saucy sweet and sour choice was a mushroom with a mock-meaty texture, served with sweet semi-dried plums. When we ordered mock fish, we didn't realise we were committing to this enormous centrepiece! Its bubbling broth held some truly excellent mock fish (even our Chinese omni companion was impressed) and all sorts of other treasures - we plucked out black fungus, lotus roots, ginger and lightly cooked and pickled vegetables. Our final dish took unusually long to arrive at the table, so much so that we'd assumed the meal was over. This looked like another mock meat but was actually a glazed root vegetable (I suspect burdock). With its crown of fried potato threads, it was the most delicately presented of our dishes and easily my second favourite after that fish. 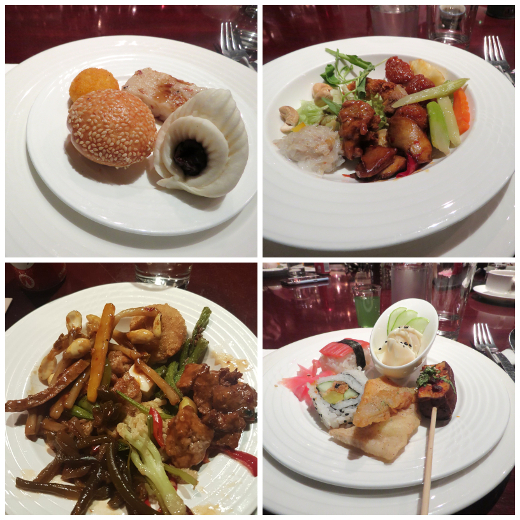 We ended up paying around AU$20 each for this four-person meal - higher than our average and well worth it. The staff were a bit aloof, but helped out when we needed them, and certainly didn't detract from the comforting peaceful atmosphere of the restaurant. We're developing a happy habit of booking cooking classes when we holiday outside Australia. Before I even got to researching our options in China, former Beijing resident and long-time friend Steph helpfully recommended The Hutong. These guys run a staggering range of tours, events and classes with a mission to share culture and knowledge. If I were in Beijing for longer, I reckon I'd book a new class every month: there's baozi, xiao long bao, Chinese gourmet pancakes, dumplings, Cantonese, Sichuan and Yunnan menus, dimsum and restaurant essentials! Our limited time in the city helped narrow our options, and I convinced Michael and Craig to join me in a class for hand-pulled noodles (300 yuan ~ AU$60 per person for 2.5 hours). With a note added to the booking form, the Hutong team accommodated our lowest common dietary denominator (vegan) without any fuss. While they typically offer 10-12 places per class, the team still committed to hosting just the three of us when no-one else happened to sign up for the same session. It was a treat to have our own personalised vegan session with lots of attention to hone our technique. These noodles are as simple as they come: plain wheat flour, a pinch of salt, and scant tablespoons of water until the dough just feels right. The key here is warm hands and patient work, bringing the dough together into a clean, slightly sticky ball and kneading it for 20 minutes until it's really, really smooth. 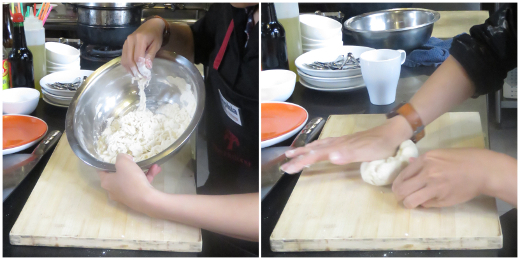 After a little rest (while we prepared a sauce for the noodles), we sliced the dough into fingers, then rolled each one into a thick noodle using the palms of our hands. 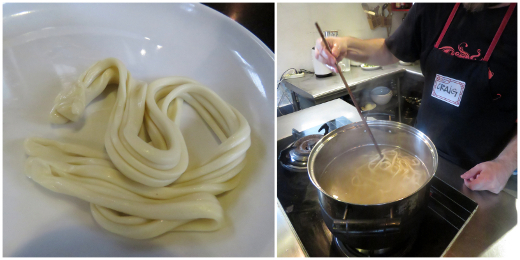 A liberal coating of vegetable oil prevents the noodles from drying out or sticking to each other. After another sauce diversion, the real fun began! Pulling the noodles calls for fast, light and confident hands to stretch the dough without excessively pinching the edges. We had plenty of pinches, breakages and laughs as we prepared our first uneven batch. None were too misshapen to eat, though, with our instructor Sophia welcoming every one of our attempts into the pot of boiling water. A judicious chopstick helped keep the noodles separated as they cooked. With our tomato and eggplant sauce all sorted, a smashed cucumber salad and some cold sodas magically appeared and we sat down to eat. Even noodles pulled by our clumsy hands are good! The Hutong team have convinced us that this is worth another go at home, and that we should share our new, burgeoning skill with friends. Since we were being hosted by friends and residents of Shanghai, we didn't do a lot of research in advance of our arrival. One thing that did pop up, though, was a monthly vegan brunch at Glam. Happily for us, this coincided with our last day in the city and we made a reservation. Glam is a glittery bar on the 7th floor of a building on the Bund, meaning that it has impressive views of the city skyline (see photo below). From the decor to the menu to the price (350 yuan ~ AU$68.90 per person compared to the ~AU$7 per person we were routinely paying elsewhere), it's clear that Glam is targeted at western migrants and visitors; little about the place indicates that we're in China at all, save for customised plates upon which Shanghai women have their heads replaced with vegetables (blergh). The menu is not only vegan but gluten-free. We started with a choice of a Virgin Mary or a mango sago drink; the sago was very welcome as I arrived hot and hungry. The amuse bouche of sesame-crusted celtuce was soy-salty and juicy, and much less substantial. The following two courses were delightfully light and fresh. We were each allowed just two beetroot ravioli, which were filled with cashew butter and apple, then garnished with candied orange. 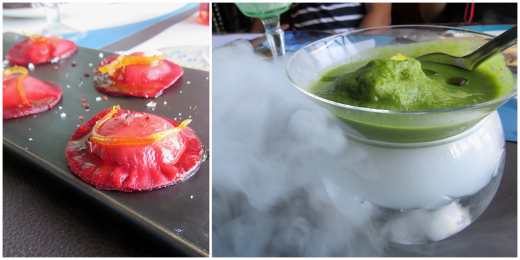 The summer soup was served with some theatrical dry ice, but I was more impressed by its soothing combination of mint sorbet, cucumber and aloe vera. 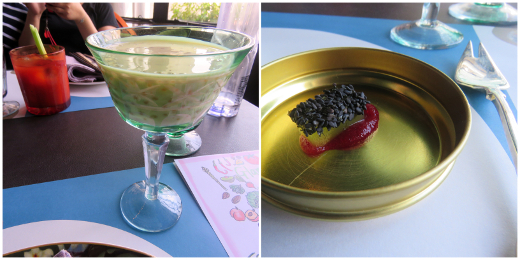 Though they weren't really complementary, the final two savoury courses were served together. 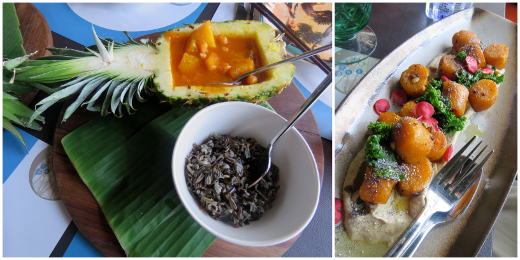 A pineapple filled with a warmly spiced chickpea and pineapple curry and wild rice side kept up the summery theme. I thought the gnocchi were more autumnal. Made with smoked kumara and cassava, they had the almost-gelatinous texture of glutinous rice dumplings. They were well accompanied by pine nut curds, kale, chilli and purple rice salt. Dessert was a sticky, deconstructed lemon pie with what I assume were miniature aquafaba meringues. This left a lovely tangy-sweet taste in my mouth long after the meal was over. After many days of eating noodles, potatoes and fried foods, the small portions and fresh vegetables at Glam went down very well. We felt weirder about the setting, which was at best an instagram trap and at worst held a whiff of cultural appropriation. 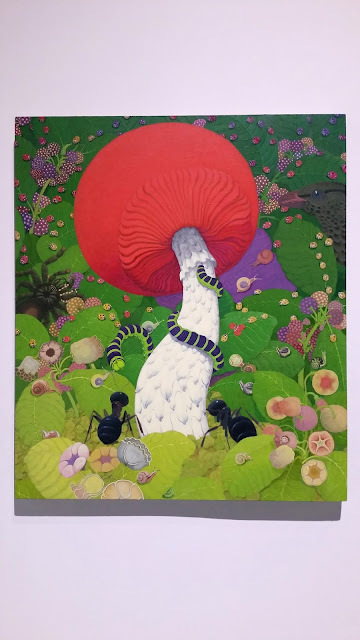 We went out of our way to visit the fascinating Shanghai Propaganda Poster Art Centre and this placed us close to vegan restaurant Gongdelin. It's a compact and peaceful restaurant with heavy, comfortable furniture and, bizarrely, a novelty VB clock on the wall. The menu includes English translations, and after days of picking through pictures at omni restaurants, it was a treat to know we could order anything. There's plenty of mock meat on offer, including 'crab', 'eel' and 'scallops' but also abundant tofu and vegetables for those who aren't into it. We, of course, were into it! 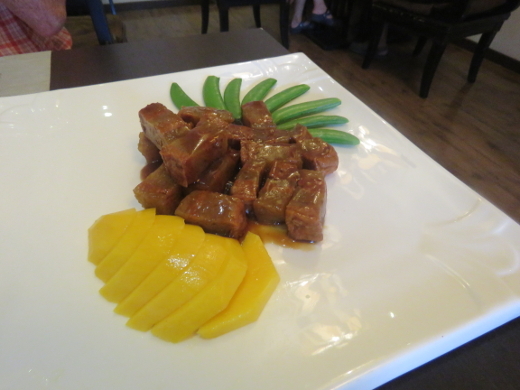 We swooped on the thickly sauced sweet and sour vegetarian 'pork' ribs (48 yuan ~ AU$9.50) the moment they arrived. The crispy vegetarian 'duck' (45 yuan ~ AU$8.90) was even more to my liking, made with coiled up layers of tofu skin, fried to create a crispy shell, with dipping sauce on the side. 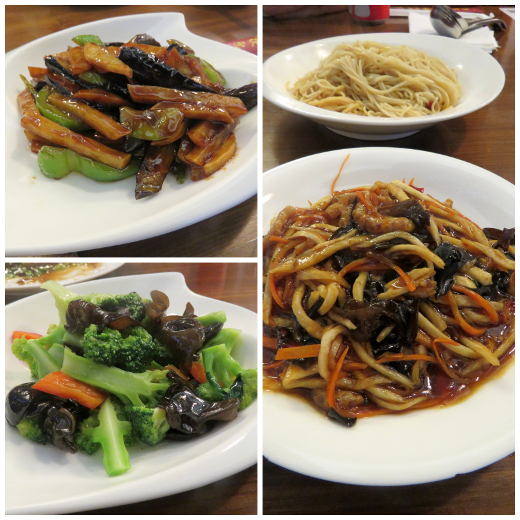 Our other vege dishes ably backed them up: stir-fried shredded potato, green bell pepper and eggplant (40 yuan ~ AU$7.90, pictured top left), stir fried broccoli (35 yuan ~ AU$6.90, pictured bottom left), and noodles with shredded 'pork' in Sichuan garlic sauce (38 yuan ~AU$7.50, pictured right). Troy and I had room for dessert, so we shared an order of pumpkin and rice balls in sweet rice wine (32CNY ~ AU$6.30). It's served very hot, quite sweet and is thick with pureed pumpkin, rice fragments and soft gloopy rice balls. Starchy and filling, it was plenty to split. This isn't a restaurant that anyone must cross the city (or the world!) for, but it's a lovely vegan escape that fit well with a visit to the Propaganda Poster Art Centre. Hello from Shanghai, China! As we’ve already mentioned on twitter, we’re here on holiday visiting a friend, wilting in the heat yet seeing the sights and eating very, very well. 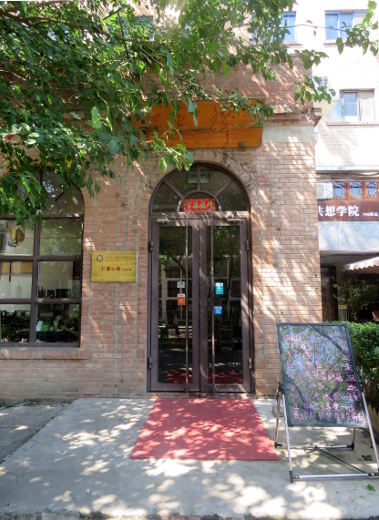 Let’s start with a vegetarian restaurant adjacent to the Jing’an Temple – it’s a location that will pop up during many visiting veg*ns’ research. The first floor of the restaurant includes a vegan-friendly bakery and a miniature food court, the second floor has a la carte service, and the third floor offers a lavish buffet setting with a flat rate of 178 yuan (AU$35.30) per person for lunch. 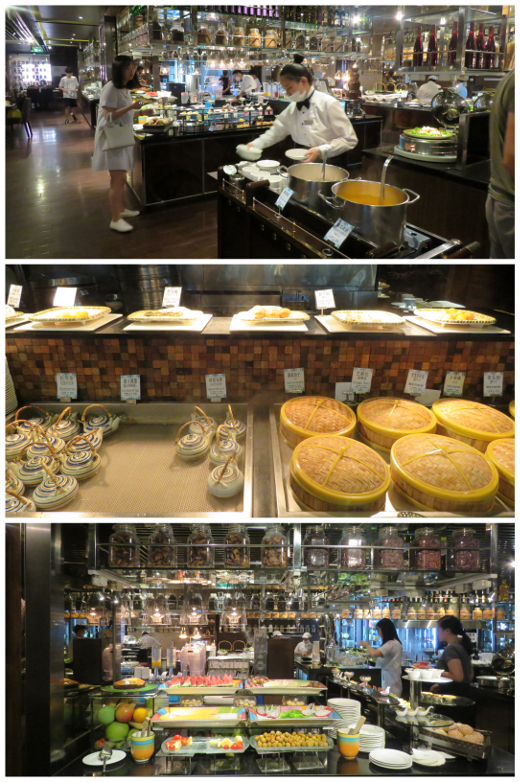 We stopped in for the last hour of the buffet and could barely believe the volume and variety of food on offer. The savoury dishes were well labelled in Chinese and in English with the food name and indicators of whether the foods contained eggs and/or milk (no hints about gluten). I enjoyed picking through the snacky section, trying sesame buns, a date-centered mantou bun, turnip cake and pumpkin cake. There’s a little Japanese section with fancy-looking sushi and other morsels. Meanwhile, Michael went hard on the stir-fries, braises and fried rice. There was a small amount of mock meat, plenty of mushrooms and tofu that almost mocked meat, and lots of straight-up vegetables too. 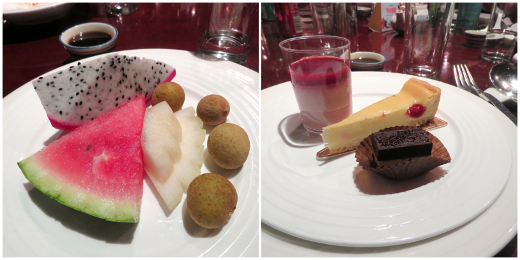 The fruit selection was a very refreshing interlude before I set upon the desserts. Unfortunately the desserts were less well labelled, and I suspect that most of the little cups and cakes contained dairy. The teeny portions allowed me the temptation of trying a few (all were very nice, though nothing different from what we can access in Oz). This buffet has the price and ambience of a slightly special occasion (we've been paying closer to AU$10 for other meals), but any hot and hungry traveller should feel welcome to stop in. 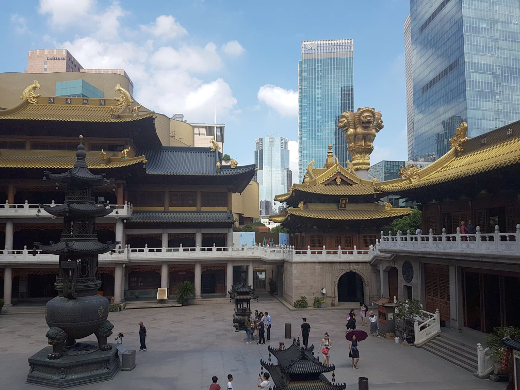 It’s an easy way to access lots of veg*n food, and it’s convenient to the handsome Jing’an Temple, which is well worth a visit.